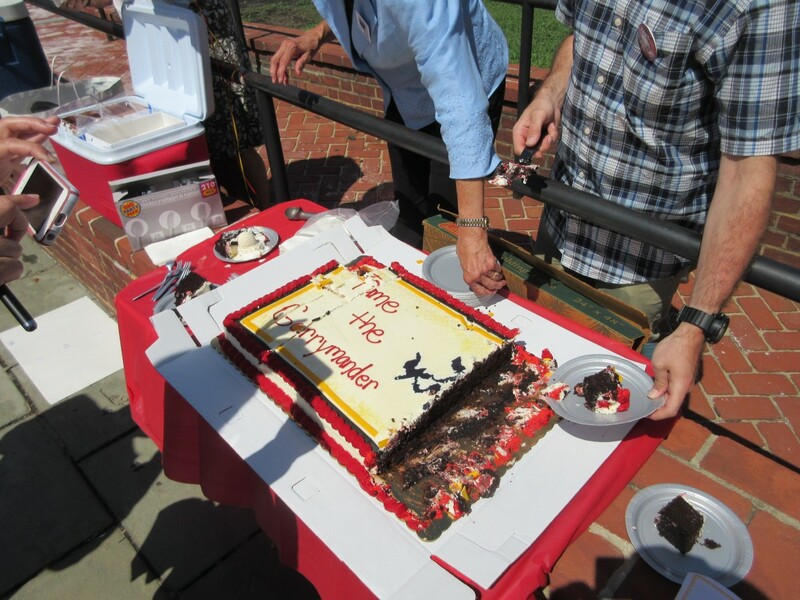 Last year's cake celebrating Elbridge Gerry's July 14 birthday by opponents of gerrymandering. On the political spectrum, my views fall within an arm’s reach of Bernie Sanders’. I’m not a moderate. I’m a 20-year-old college kid who has never come close to voting for a Republican, which is why I consider it my duty to admonish the Democrats of the Maryland state legislature over the congressional districts that they drew and ratified in 2011. These legislators are facing renewed legal challenges in federal court last week on the grounds that the eight creatively drawn districts violate the first amendment rights of Republican voters in Maryland. I don’t spend much of my time defending Republicans. Let me be clear; the prospect of continued GOP dominance in the House has me shaking in my boots. I can’t, however, accept the flagrant nature of the gerrymandering that took place in Maryland. The student bringing the lawsuit is right; the districts are unfair, and the right thing to do is to redraw them. But even if the politicians don’t care what is fair or right (and the prevailing public feeling is that they do not) Democrats should still redraw the districts. The irony is that what looks like a clever move by the Dems in the legislature is only hurting the party at the national level. By engaging in the same transparent tactics that the rival Republicans use elsewhere, Maryland Democrats are forfeiting the party’s credibility to fight Republicans on this issue in other states. Gerrymandering is a major problem not limited to Maryland. Republican state legislatures in states like Texas, North Carolina, and Florida have drawn congressional districts in recent years that include all sorts of imaginative peninsulas, isthmuses, and satellite neighborhoods. Notably, in Austin, Texas, Barack Obama won 60% of the vote in 2012. One might expect Democratic congressmen to represent the liberal capital city, but of the six congressmen representing Austin, only one is a Democrat. Texas legislators have made sure that the substantial liberal population in Austin is underrepresented in Congress. This is an egregious violation of Austin’s voters’ rights to have their voices heard. Yet how can they complain when Republicans in Texas could point to a state like Maryland, where the same dirty game is being played? In fact, it is in Democrats’ best interests to fight gerrymandering on all fronts. While it would hurt them in Maryland, losses would be far outweighed by the benefits of creating fairer districts nationwide. After Republicans captured a wave of statehouses in 2010 and had time to redistrict, the GOP profits much more from gerrymandering than Democrats do. Political strategists agree that a true elimination of gerrymandering (as fanciful as that is) would result in a wave of red-to-blue transitions in states like Texas, North Carolina, Florida, and Pennsylvania. The situation in Maryland gives the GOP a way to justify its own bad behavior, effectively ensuring that Republicans will maintain a majority in the House for years to come. The Republican Party is no stranger to shifty behavior, and with Donald Trump at the top of the ticket in 2016 there has never been a better time for Democrats to claim the moral high ground. America faces a divisive choice, and Democrats are desperate to portray themselves as the defenders of the rights of ALL Americans, regardless of race, gender, sexuality, and class. Running opposite Trump’s xenophobic rhetoric, the Dems could have a convincing argument. Why ruin the narrative by playing short-sighted dirty politics? The moral high ground is available, but Dems can’t claim it just by virtue of being not-Donald-Trump. They must earn it, and it starts with establishing a competitive congressional map. Politicized redistricting is still technically legal, but that doesn’t make it right. I hope that the three-member panel of the U.S. District Court opines against the state and that the state is forced to redraw the map. I challenge Democratic congressmen in Maryland to compete in fair elections. And if a Democratic push against gerrymandering in all states leads to a liberal majority in the House, well, you can thank me later. Eli Briody-Pavlik can be reached at ebriodypavlik@gmail.com.